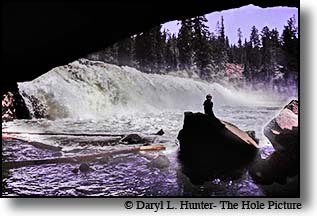 Yellowstone's West entrance is only about 30 miles from Ashton and the south west corner is only about 25 miles where you can view the beautiful cave falls and fish the remote Bechler River. 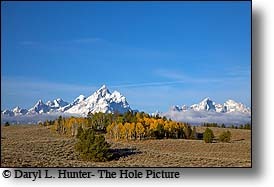 Grand Teton National Park can be accessed by the rustic and adventurous Flag Ranch/Ashton road that will dump you off on the north end of the park. This is a Dirt road but a wonderful drive. You can find this road southeast of Ashton Idaho. 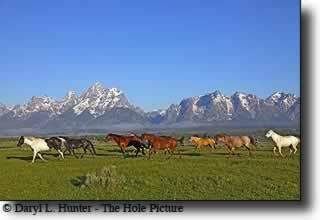 Established in 1929, Grand Teton National Park emerged from a complicated and controversial series of events. 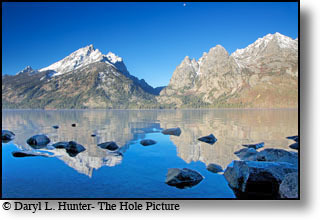 The park first consisted of the mountain range and several glacial lakes. 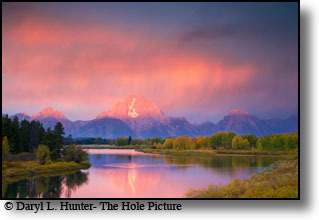 Later the valley floor was protected as Jackson Hole National Monument. The two areas were combined in 1950. 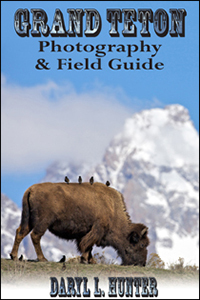 Today the park encompasses nearly 310,000 acres and protects the Teton Range, Jackson Hole (mountain valley), a 50-mile portion of the Snake River, seven morainal lakes, over 100 back country and alpine lakes, and a wide range of wildlife and plant species. About a mile below Upper Mesa Falls you can find Lower Mesa Falls, equally majestic but it lacks the great access of upper Mesa Falls. 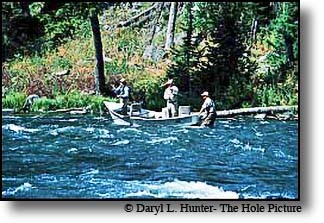 The world famous fly fishing river The Henry's Fork of the Snake flows through the Island Park Plateau and provides many fishing and sightseeing opportunities. Tucked in the southwest corner of Yellowstone National Park, the Falls River basin is truly a fisherman's and waterfall lover's paradise. The Fall River is aptly named because of the many waterfalls along its tributaries. 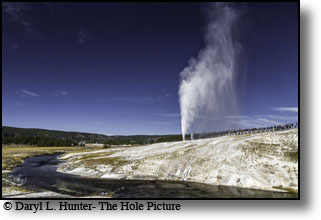 This is the major river that drains the Cascade Corner, of Yellowstone Park. The four major streams in the Fall River drainage are the Belcher River, Boundary Creek, Mountain Ash creek and of course the Fall River. 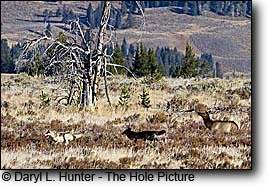 They begin on the Madison and Pitchstone plateaus and they carve canyons across Yellowstone Park's southwest corner. 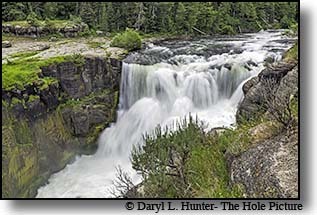 Some of Yellowstone's most beautiful waterfalls are in this area. As the runoff of many creeks drop off the Madison and Pitchstone Plateaus, many waterfalls are formed. 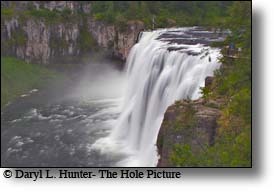 With nearly 80 inches of annual precipitation, the Falls River drainage is one of the wettest portions of Yellowstone National Park. The Falls River is a backpacking, fisherman, and photographer's nirvana. 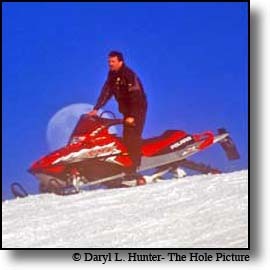 It is a snowmobilerÍs winter wonderland in the Island Park Idaho region where you can escape to prodigious hordes of powder and hundreds of miles of groomed trail; horizons of snow-capped peaks beckon, powder blanketed valleys of white entice you off your groomed trail, and breathtaking scenery stops you in your tracks. Each Winter Island Park is the beneficiary of average of 229 inches of snow. 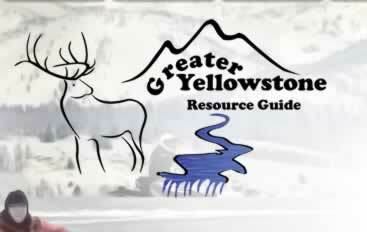 Hundreds of thousands of acres of public land are open to snowmobiling and exploring. Big Springs as the name implies is one big spring that flows out of the mountainside into a large creek that rapidly turns into a small river. Rainbow Trout wait under the nearby bridge for tourists to throw them food some get as big as 10 pounds. Harriman State Park is a public recreation area located on the 11,000-acre Harriman Wildlife Refuge in Fremont County, three miles south of Island Park in eastern Idaho, United States. 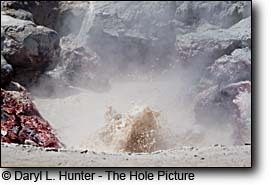 The state park is within the Henry's Fork Caldera in the Greater Yellowstone Ecosystem. 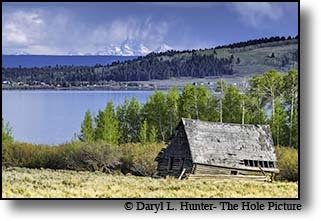 This legendary fishery is a high mountain lake nestled between, the Centennial Mountains and the HenryÍs Lake Mountains, is fed by numerous small streams and springs and is the kind of place fishermen dream about. HenryÍs Lake is 4.5 miles long by 3.5 miles wide and is a relatively shallow lake, only about 25 feet in the deepest spot. 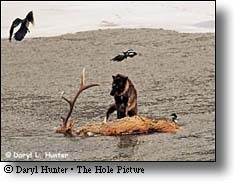 The shallow water and heavy weed growth make Henry's Lake a fly fisher's dream. 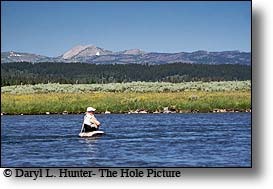 Henrys Lake is probably the finest fly-fishing lake in Idaho. 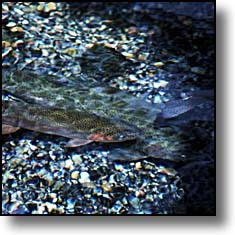 Much of its water comes from springs, and the lakeÍs rich aquatic growth provides tremendous nourishment for fish. Like Jackson Lake, HenryÍs Lake is a natural lake that was tripled in size by a dam. HenryÍs Lake State Park, the Lake, and the world famous HenryÍs Fork Rivers that starts from the lake are all named after explorer Major Andrew Henry, a famous trapper and mountain man.